Providing you the best range of upc & bar codes software 10 pcs with effective & timely delivery. UPC (technically refers to UPC-A) consists of 12 numeric digits, that are uniquely assigned to each trade item. 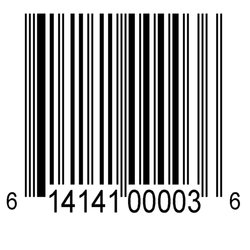 Along with the related EAN barcode, the UPC is the barcode mainly used for scanning of trade items at the point of sale, per GS1 specifications. UPC data structures are a component of GTINs and follow the global GS1 specification, which is based on international standards. But some retailers (clothing, furniture) do not use the GS1 system (rather other barcode symbologies or article number systems). On the other hand, some retailers use the EAN/UPC barcode symbology, but without using a GTIN (for products sold in their own stores only). Looking for “UPC And Bar Codes”?